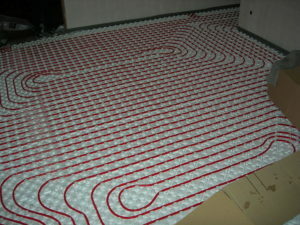 Radiant floors use hot water from the boiler to heat a coil hidden below the finished floor. This heat emitter configuration has a few advantages. First, it is wall to wall so there are no baseboard units to inhibit furniture placement again the wall. Second, because heat rises, it keeps the room barefoot comfortable—this is especially important in rooms with cathedral ceilings. Finally, radiant floors use low temperature water. Fin-style baseboard and other hot water heat emitters require a water temperature of 160-180ºF. Radiant floors work best at a water temperature of 120-140ºF. That means that in addition to boilers that are fired on oil, gas, or wood pellets, radiant floors are also well-suited to work with air-to-water or geothermal heat pumps. In homes that already use high water temperatures, the radiant zone can be mixed down to the lower water temperature needed for radiant floors. These two excellent videos explain how radiant loops can be embedded in concrete, or run under a wood sub-floor. 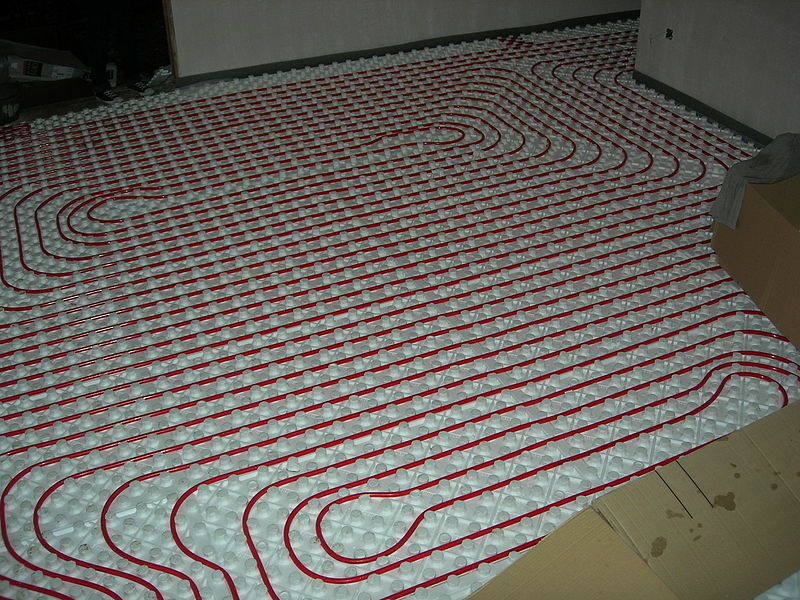 When evaluating radiant floor heating, consider the insulating value of the finished floor layers that will cover the radiant loops. In this case, low insulating values are better. You want surfaces that conduct the heat from the radiant loop through the sub and finished floors into the room.